Walking through the winding cobblestone streets between my apartment on Via Giulia and the Rome Center, there are many bikes chained to various street signs and poles. 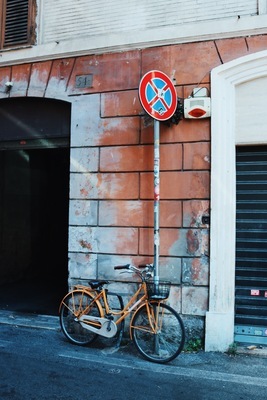 Roman bicycles were of all colors, sizes, and shapes and were a necessity and identity to citizens who needed a smaller mode of transportation through these tiny but beautiful streets. Surber, Hudson, "Bikes of Rome" (2017). Study Abroad Photo Contest. 62.